Scott McLaughlin has prevailed in an especially tight final practice session at the Coates Hire Ipswich SuperSprint which saw Jamie Whincup come under investigation for a pit exit incident. Less than a tenth of a second separated the top four of McLaughlin, Whincup, Craig Lowndes, and David Reynolds at the end of the 45-minute session. The #17 Shell V-Power FGX Falcon only went to the top of the order in the last minute when McLaughlin laid down a 1:09.0645s. The lap was just 0.0156s faster than Whincup’s best in the #1 Red Bull HRT ZB Commodore, who was in turn 0.0732s faster than team-mate Craig Lowndes in the #888 Autobarn ZB Commodore. Whincup spent most of the session at the top of the timesheets, interrupted for a brief spell by Lowndes. The defending Virgin Australia Supercars champion is, however, under investigation for exiting pit lane to the wrong side of the witch’s hats and traffic light as he prepared for a practice start before heading back onto the circuit. “I needed to do a practice start; I had a couple of shockers in Townsville,” explained Whincup. “So I did a practice start, but it’s only practice, (so) no one cares about the cone at the end of pit lane. Regarding his performance, he added, “It’ll (the weather) probably heat up, we’ll probably go slower. “My car’s good, we got through our program, we’re under control. Reynolds was already third when he improved marginally during his final run but held position in the #9 Erebus Penrite ZB Commodore, before McLaughlin’s rise. Shane van Gisbergen (#97 Triple Eight ZB Commodore) also snipped some time off his personal best right at the end to sit just 0.1172s off his compatriot’s benchmark. Michael Caruso (#23 Drive Nissan Altima) was the first of the Nissan Motorsport entries in sixth, one position ahead of team co-owner Rick Kelly (#15 Castrol Nissan Altima). Richie Stanaway’s best lap was good enough for fourth at the time before the #56 Rabble.Club FGX Falcon was ultimately shuffled back to eighth. Tickford Racing team-mate Chaz Mostert was next on the timesheets in the #55 Supercheap Auto FGX Falcon, with rookie James Golding (#34 Wilson Security GRM ZB Commodore) rounding out the top 10. 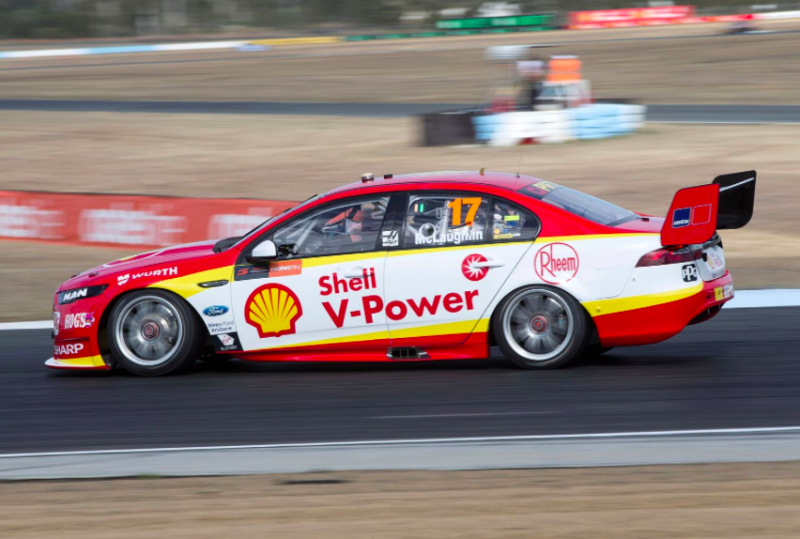 Fabian Coulthard was 11th in the #12 DJR Team Penske FGX Falcon and Jack Le Brocq 12th in the #19 Tekno Autosports ZB Commodore, the latter of whom is also under investigation for a practice start outside pit exit. Mark Winterbottom (#5 The Bottle-O FGX Falcon) was the third of the Tickford Fords in 20th, while wildcard entrant Kurt Kostecki (#42 Kostecki Brothers Racing VF Commodore) rounded out the 27-car field. The field returns to the track for Armor All Qualifying for Race 19 at 1325 local time/AEST.